To uncover a deception, sometimes it’s necessary to search for subtle indicators which may reveal that something just isn’t right. Immediately after the Trump regime announced the Bashar Al Assad government had gassed its own people, the president authorized a barrage of cruise missiles be sent into Syria purportedly in an attempt to send the message the U.S. would not sit idly by while a rogue government attacks its own people. Trump’s supporters stood as a bulwark behind their president as he led the nation as aggressors to attack a sovereign country. However, others, such as MIT professor Theodore A. Postol, wanted more. They wanted proof. The proof never came before the cruise missiles were launched and still has not been provided to the American people. The only thing the Trump regime has offered are words, which it apparently wants all Americans to trust. That being said, the American people are smarter than they were when their government told them there were “weapons of mass destruction” in Iraq. All of which is no surprise to Postol, who is now calling the Trump regime to the carpet over its declaration a chemical attack took place in Syria, and over its motivations for doing so. Theodore A. Postol, professor emeritus of science, technology, and national security policy at MIT. Postol’s main expertise is in ballistic missiles. He has a substantial background in air dispersal, including how toxic plumes move in the air. Postol has taught courses on weapons of mass destruction – including chemical and biological threats – at MIT. Before joining MIT, Postol worked as an analyst at the Office of Technology Assessment, as a science and policy adviser to the chief of naval operations, and as a researcher at Argonne National Laboratory. He also helped build a program at Stanford University to train mid-career scientists to study weapons technology in relation to defense and arms control policy. Postol is a highly-decorated scientist, receiving the Leo Szilard Prize from the American Physical Society, the Hilliard Roderick Prize from the American Association for the Advancement of Science, and the Richard L. Garwin Award from the Federation of American Scientists. Reportedly using the same commercially available video footage the White House said it used to conclude a gassing had taken place, Postol examined YouTube uploads of the site where the U.S. says the Sarin gas was released. 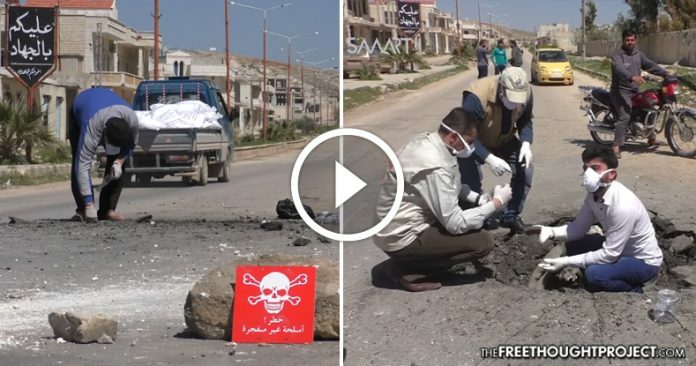 In the first of two videos examined, a man can be seen handling a dead caged bird (reportedly killed by Sarin residue) with one surgical glove on one hand and a bare hand on the other. “The implication of these actions was that the birds had died after being placed in the alleged sarin crater. However, the video also shows the same workers inside and around the same crater with no protection of any kind against sarin poisoning,” wrote Postol. The poison gas expert said the preventative measures taken by the Syrians would have killed them. The MIT professor openly doubted whether they had any training at all, even though in the second video they were dressed in attire labeled “Idlib Health Directive” written in English (for what purpose other than to mislead an English-reading video audience). Postol also noted that other bystanders were wearing no protection at all in an area where nearly six dozen Syrians were reportedly killed in a lethal sarin gas attack. He concluded the WHR itself was not properly vetted before it was released to the public. Professor Postol openly wondered about the motivations for issuing such a flawed report, as if there existed other motivations for knowingly deceiving the American people. The MIT munitions and chemical weapons expert selected several statements from the WHR which apparently disturbed him, and for which he later said needs to be thoroughly investigated. The following statements were made by the Trump regime in the WHR, statements Postol says are based on flawed video evidence. The United States is confident that the Syrian regime conducted a chemical weapons attack, using the nerve agent sarin, against its own people in the town of Khan Shaykhun in southern Idlib Province on April 4, 2017. We cannot publicly release all available intelligence on this attack due to the need to protect sources and methods, but the following includes an unclassified summary of the U.S. Intelligence Community’s analysis of this attack. By 12:15 PM [April4, 2017] local time, broadcasted local videos included images of dead children of varying ages. Commercial satellite imagery from April 6 showed impact craters around the hospital that are consistent with open source reports of a conventional attack on the hospital after the chemical attack. Moscow has since claimed that the release of chemicals was caused by a regime airstrike on a terrorist ammunition depot in the eastern suburbs of Khan Shaykhun. An open source video also shows where we believe the chemical munition landed [Emphasis Added]—not on a facility filled with weapons, but in the middle of a street in the northern section of Khan Shaykhun. Commercial satellite imagery of that site from April 6, [Emphasis Added] after the allegation, shows a crater in the road that corresponds to the open source video. The professor went on to declare, based on the video evidence, that the White House Intelligence Report itself (WHR) was, “fabricated without input from the professional intelligence community,” an explosive claim to say the least which points the finger of blame directly at the Trump regime for lying to the American people without any concrete evidence. Equally disturbing to some is the fact the president’s actions brings the United States closer to an armed conflict with Russia, a country who’s also, ironically, determined to defeat ISIS in Syria. Yet, as The Free Thought Project has reported, members of Congress have spoken out against the U.S. Government’s funding of terrorists, the same ones featured in the video’s which purported to show a Sarin gas attack occurring in Syria perpetrated by the Syrian government on its own people. It is now obvious that this incident produced by the WHR, while just as serious in terms of the dangers it created for US security, was a clumsy and outright fabrication of a report that was certainly not supported by the intelligence community. I therefore conclude that there needs to be a comprehensive investigation of these events that have either misled people in the White House White House, or worse yet, been perpetrated by people to protect themselves from domestic political criticisms for uninformed and ill-considered actions. It remains to be seen whether or not members of Congress will actually call for a committee to investigate the Trump regime’s actions taken in Syria, but already, many Americans are calling for a regime change of their own. The movement to impeach Trump may gain steam as more and more experts like Postol are speaking out against their president’s thoughtless and reckless actions. Note: Please see original .pdf uploaded here for more organized presentation of the screenshots.